I wasn’t aware of this event, but I am happy to celebrate it now. Many of my friends know about my interests in fitness and that I’m currently training for the Nation’s Tri. But talking with my friends about National Running Day was a great way to spark a new conversation about health and fitness. I will never forget how I felt nearly four years when I started running with the Living Person group at John Carroll University. Running was something I really struggled with during high school. I was the goalie for my school field hockey team and I always dreaded the one time per season that we had to run timed 2 miles. Before high school, I was never interested in running even short distances and could not imagine running a half marathon. All of that changed when I became a part of an inspirational and motivational community, the Living Person. Being friends with Jurell and Craig, the leaders of the Living Person group, allowed me to challenge myself. My first personal challenge was to run a 5k, the Footprints for Fatima race at John Carroll during Homecoming weekend 2011. I enjoyed that race and decided to take on a bigger challenge, the Peace Race, a 10K in Youngstown, Ohio later that fall. I remember just before Christmas break that semester Jurell and Craig talking about how they were going to try and run their first half marathon in the spring. I thought to myself, jeez I’ve done all these other things I didn’t think I could do. Maybe I can do that too! Sure enough I followed my training plan and March 2012 I ran my first half marathon with my best friend Sarah Castellano by my side every step of the way. 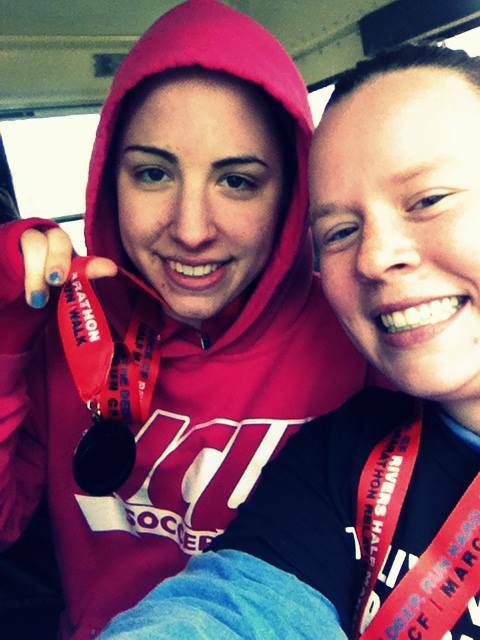 Finishing my first half marathon was a turning point in my health and fitness. I realized that if I put my mind to a goal then I could achieve it – even if it seemed out of reach at first. Incredibly, all of this confidence stemmed from the simple act of running! It’s important for me to reflect back on where my fitness journey has brought me over the years, especially now that I’m gearing up for some much bigger personal fitness goals. The Nation’s Tri on September 13th will be a race of many firsts for me: my first Olympic distance triathlon, my first open water swim race, and my first road bike race. Along the way I’m hoping to continue to blog about my training, especially tri-specific training. My other big personal fitness challenge coming up is still about 9 months away. A few weeks ago after talking with my dad and a lot of personal reflection, I decided to sign up for my first marathon! Next March I’ll be running the Tobacco Trail Marathon in Cary, North Carolina. This race was recently recognized by Runner’s World as one of the 10 best new marathons. My dad and my brother ran the marathon together this year. And next year I will be out there running it with my dad by my side! I truly believe no matter how big or small your fitness goals seem, if you set up a plan for yourself, have a good support system, and put in the work, then anyone can achieve their goals. I never dreamed I would run a half marathon before I could barely run a mile. Truthfully some days I still have a hard time running a mile! Personal fitness is something that is continually being improved and is different for everyone. So today for National Running Day, I encourage you just to go out there and RUN! P.S. if you’re interested in taking a bigger leap and signing up for a triathlon, join me at the Nation’s Tri September 13th. There is a one day sale today in celebration of National Running Day, no code needed! This past week I took the FSOT (Foreign Service Officer Test). This was the second time I have taken the test which is the first of many steps to be considered for employment at the Department of State. The first time I took the test was October 2012. I was still a senior at John Carroll. I did not really know what to expect the first time I took the test. I did not study much the first time, in part because I was busy with school commitments. After reading several different blogs on how to study for the test, this time I purchased a few apps in the iTunes App Store that are designed to help students prepare for AP exams. I used an app for AP US History and AP World History and found them to be very helpful. I felt much more comfortable on the actual test day this time. I was very close to passing the test last time. However the way the hiring process works for the State Department, someone who barely passes the test probably won’t make it very far anyway and it is highly unlikely to be hired. Obivously I hope that I pass the test this time, but we’ll see! When I was in Lebanon we met with officials from the embassy. Everyone I met there said they had taken the test multiple times, some up to eight times! The one thing I realized quickly taking the test this time was a weakness of mine was writing the essay. It’s strange because I consider myself to be a good writer. I frequently write emails and reports for work. But writing essays like you do in school is not something that is found in the traditional working world. So moving forward, I am making a commitment to more blogging so that I can continue to improve this unique style of writing which is similar to short essays. The photo is from a few weeks ago when I took the Megabus from DC to Pittsburgh. The blog title “As the leaves change…” symbolizes the change I am making by committing to blogging! It’s been a busy week at the Krash house with lots of coffee consumed, midnight dance sessions, and ice cold beers enjoyed out on the porch in the evenings. In the midst of it all, we are fortunate as Krash residents to have our linens (bedding and towels) cleaned and changed once a week. I was lucky enough to get to meet two of the people who make this all happen. Krash is committed to using local services whenever possible and supporting small businesses, which I think is awesome! So here in DC they are currently working with a company called Wash Cycle Laundry. And the reason I’m sharing this is because Wash Cycle Laundry is not your typical laundry service. Wash Cycle Laundry was founded in Philadelphia in 2010 and just recently expanding to Washington DC. There are three main reasons why I think Wash Cycle Laundry is a great company. The first reason why Wash Cycle Laundry is neat (haha punny!) is that they “Say ‘No’ to Dirty Laundry” meaning they use locally-made, hypoallergenic detergents, high-efficiency machines, and an organic dry-cleaning process free of chemicals. They are a green company that cares about the environment and the chemicals that are around us. Who doesn’t like that? The second wonderful thing about Wash Cycle Laundry is the fact that their commitment to being green doesn’t stop with their detergents. They use bicycles (and tricycles!) to pick up and deliver the laundry. Their bikes can haul up to 300 pounds or up to 600 pounds on electric assist tricycles. 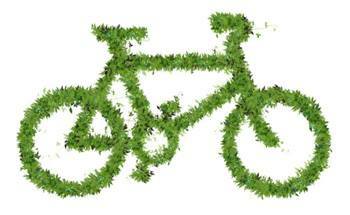 The bikes are more affordable than trucks and also can move faster in city streets. I saved the best for last. The final reason I think Wash Cycle Laundry is a part of a new, innovative and socially responsible future is their commitment to “laundry as a launching pad.” Wash Cycle Laundry has partnered with two organizations in Philadelphia, Philadelphia Works and Gearing Up, which are committed to providing opportunties for underserved communities, like previously incarcerated individuals. I can only imagine that since DC is the first city Wash Cycle Laundry has expanded to that they will continue to form partnerships of this kind in additional locations. In short, I think that Wash Cycle Laundry is doing great things and hopefully will continue to see growth and expansion to additional cities in the near future. For more information, check out their website: http://washcyclelaundry.com/. 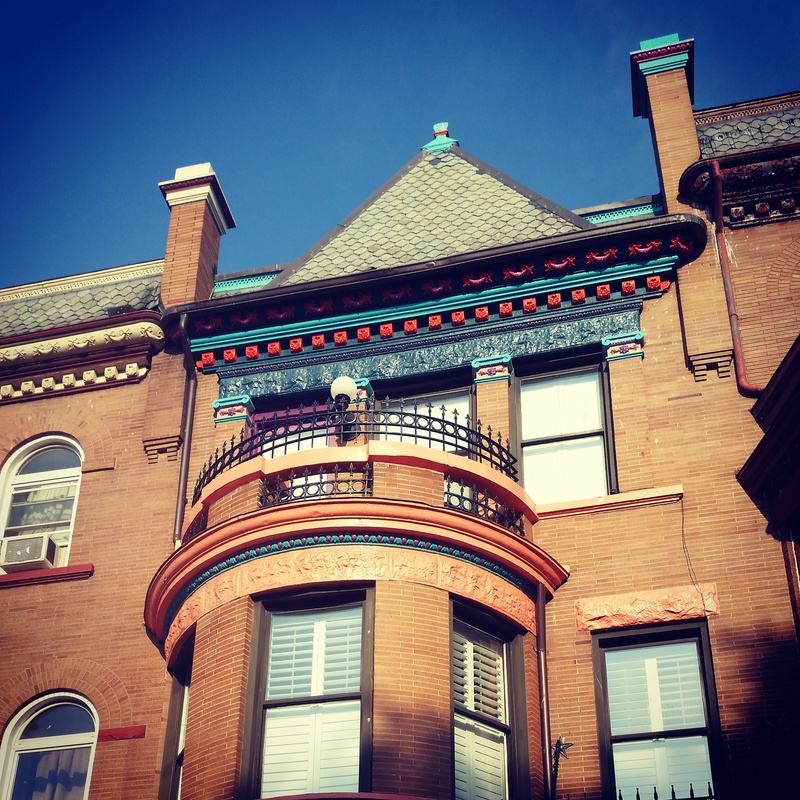 There was also a recent write up about them by InTheCapital: http://inthecapital.streetwise.co/2014/06/10/dc-tech-wash-cycle-laundry/. Photos are from Wash Cycle Laundry. Tonight is wrapping up my first weekend living in DC. I couldn’t have planned a more perfect weekend. 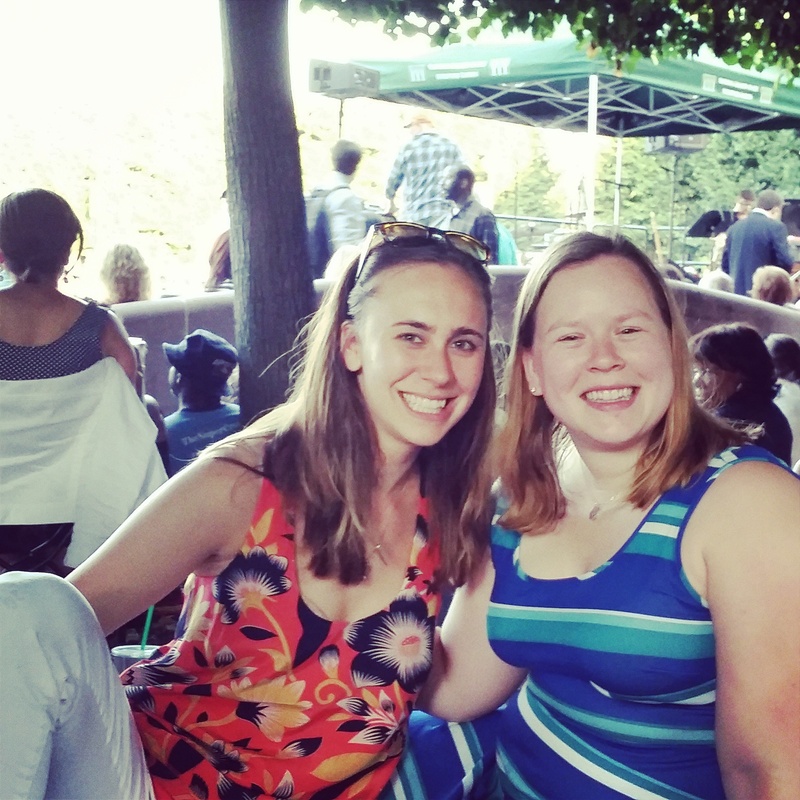 Friday night I went with several of the roommates to Jazz at the Sculpture Garden. The concerts are completely free. There is a different artist each week, we heard the Speakers of the House. Lots of food trucks parked nearby and I picked up dinner there. I highly recommend anyone in the DC area for the summer to go check out this concert series. After listening to Jazz and drinking lots of sangria, we headed out to the bars. We ended up starting the night at Nellie’s, a gay bar. This was surprisingly my first time at a gay bar. We later went to Local 16 which had a really nice rooftop patio, but reminded me of City and East on the inside (only JCU friends will know that gem!). Saturday was an uneventful day. Sunday I woke up and did Serena Fit in the morning with four of the guys from the house. Serena was an awesome fitness instructor. She kicked our butts! Luckily I was able to stick it out the whole time… can’t say the same for all of the guys! After Serena Fit, we stopped by the Bloomingdale Farmer’s Market where Ari was representing PureJoy. PureJoy is organic baby food. Right now they deliver locally to families in the DC area. While at the market, I stopped at a booth with some yummy looking samples. I found out that the booth was run by Joe Yonan, Washington Post food editor. He was selling his cookbook, “Eat Your Vegetables.” I was really excited since the subtitle is “Bold recipes for the single cook.” I’m always interested in cookbooks that are aimed towards smaller portion sizes so I don’t have tons of leftovers. The two samples that he provided were delicous, so I will try and recreate them soon. Once we got back to the house, everyone showered and then a group of us went out again to Trader Joe’s. Every Sunday night we have family dinner so we picked up stuff for family dinner. On my to do list for this week is to find a salon in DC so I can get my hair cut, preferably an Aveda salon. My next post I am going to write about the laundry service that Krash uses, don’t worry it’s actually pretty cool! On Sunday, I packed up my parent’s Honda Pilot and we drove the 342 miles from Hudson, Ohio to my new home for the next four months in Washington DC! 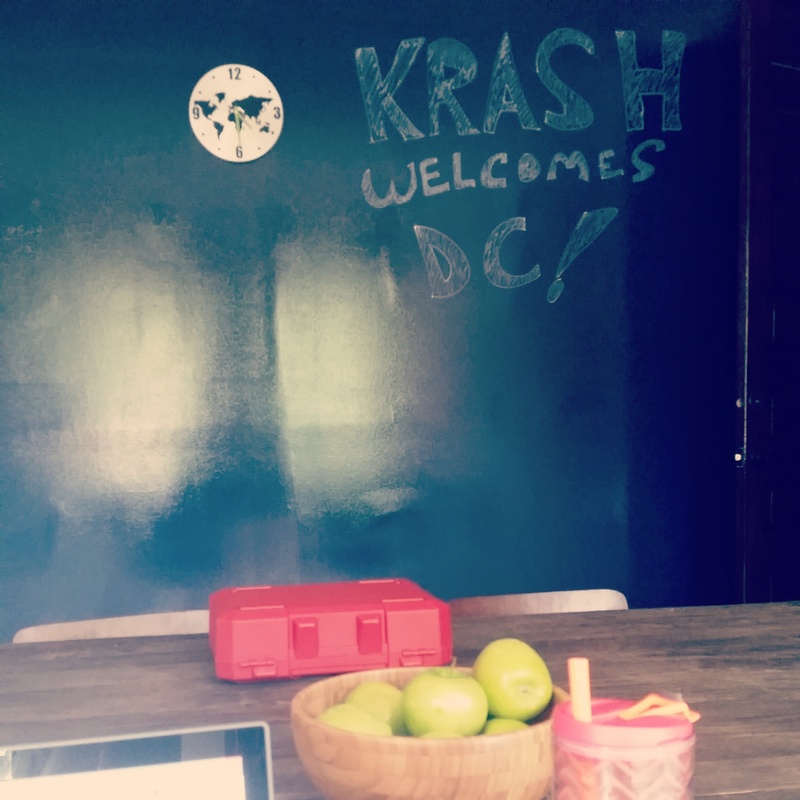 I am relocating to DC, but for my first few months here I will be staying in a community called Krash. 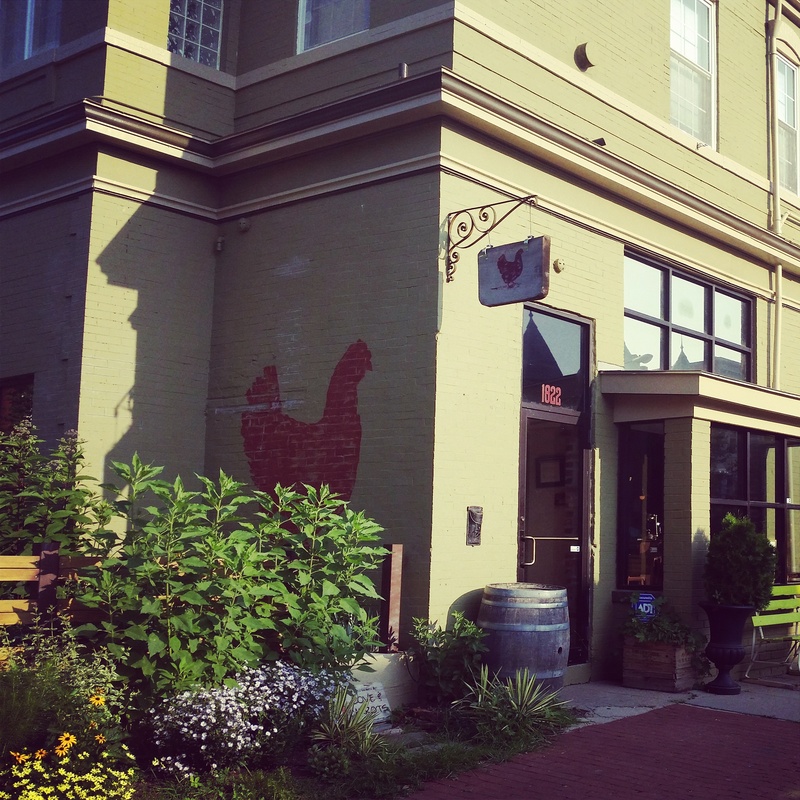 Krash has just launched in DC with a location in the Bloomingdale neighborhood. There are 14 other Krashers staying here with me. They are all involved with really cool projects, internships, start ups, etc. Every Sunday Krashers have family dinner. After I was settled in this past Sunday, I went down for family dinner. It was a great opportunity to meet many of the other residents and some of their friends as well. I was very impressed by some of the dishes brought by my roommates. For example, one roommate grilled amazing shrimp kabobs and another made a delicious corn, black bean, and avocado salad. In addition to impressive culinary skills, it was fascinating to talk with my roommates about all of their ideas and projects. The creative energy is contagious and I am excited to see what the next few months have in store. Some more about Krash: Krash was founded in Boston. There are three Krashpads in Boston, three in New York City, and is continuing to grow at a rapid pace across the country (and soon the world!). Krash is a full service short term housing solution. Residents can focus on their startups, personal projects, and interests, rather than worry about the logistics of their living situation. Some amenities provided by Krash are a twice weekly cleaning service, linen service, gourmet kitchens stocked with staples, and much more. There are no TV’s in any Krash locations because the emphasis is on the experience, building relationships and learning from the other roommates. Although, here in Bloomingdale (and all other Krashpads) we do a have a large projector screen so we are able to congregate together and watch the World Cup! So that is a little about Krash and my start to DC. I hope to post many more updates over the next few weeks! Please let me know if there is anything specific you would like to hear about. It is easiest for me to share here so I can inform everyone. My Shutterfly photo book arrived today! 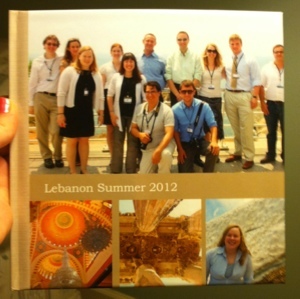 It’s filled with tons of photos from Lebanon. I will be bringing it with me to all of my presentations. I can’t wait!